ENTER MY GIVEAWAY! CLICK HERE FOR DETAILS! Only two days left! 2. Choose picture folder number 6 and open. 3. Find picture number 6. 4. Upload this picture to your blog and write a small text about it. 5. Invite 6 new to challenge, place their link on your blog and add a comment to their blog to notify them about the challenge. 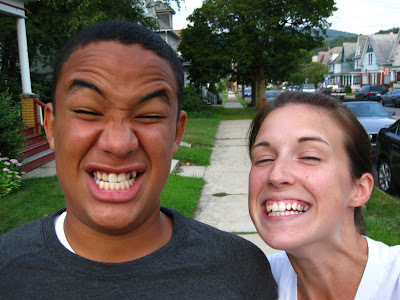 This is my super tall nephew Marcus and I before our evening walk last summer being silly. I always take my camera before we go and sometimes the pictures are quite comical as you can tell! So now I challenge you! I know it says to challenge 6 people but it's sorta fun to go back into a folder filled with pictures that you haven't visited in a while. Do me one favor though- leave me a comment if you do the challenge and I'll update this page to make sure your blog name and address is on it so others can check out your picture as well. Okay with all that said I must get back to my growing pile of work....Is it Friday yet? Ooo I can't wait to get home so I can do your challenge! !